A guide to the most common types of domestic heating and hot water systems with diagrams, including indirect boiler system, unvented system, thermal store. A guide to the different ways of heating domestic hot water so you can identify problems and faults with the hot water tank or central heating system and carry out any maintenance needed. Advice on identifying the type of hot water system you have and the types of maintenance needed, faults with the heating system and how to carry out any maintenance needed. Advice on identifying the type of hot water system you have and the types of maintenance needed. In the majority of houses in this country, there are two different types of hot water system. The circulation from a boiler around the radiators is the central heating system. The water to your taps is the domestic hot water. The water to your radiators is the central heating system. Although both share some of the main components in the heating system, the water and pipework is not mixed. Different ways of heating the domestic hot water need to be understood in order for the home owner to identify theirs and effect any maintenance needed. It will also be necessary to asses any type of shower you may wish to install. This category, although the hot water is always stored in a cylinder or tank, can be further divided into three categories. Immersion: An immersion heater is an electric element which screws into the hot water tank. This element is wired to the mains electrical supply via an isolating switch, a thermostat to control the temperature, and sometimes a timer which enables you set the times you wish to have the water heated. Using a timer, together with a well insulated tank, it is possible to heat the water when electricity rates are at their cheapest (Economy, 7 between 12 midnight and 7 am), and use it during the day. It is worth remembering that the hot water from an immersion heater is always drawn from the top of the cylinder, where it has risen over the cold water underneath (convection current). The cold water, fed to the tank from underneath, gives the hot water the pressure it needs to leave the cylinder, from the top, when required by the taps. Some tanks can contain two elements, giving you a choice as to how much water you want to heat up at any one time. It is quite rare nowadays for the immersion heater to be the only method of domestic water heating in a home and the immersion is generally used as a back up to one, or both, of the following two methods. All materials and tools necessary for the maintenance of your hot water system are available at Plumbworld. In older houses, with a direct system, the hot water may be stored in a square galvanised tank. The principle is the same. 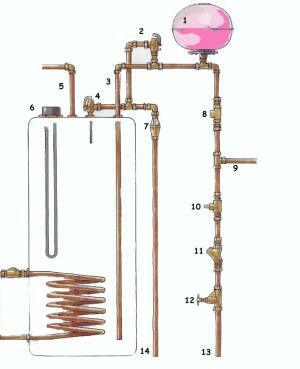 Using the diagram above as a reference, another cold water pipe runs from the base of the cylinder to the boiler. The boiler heats the water and returns it to the tank higher up. When hot water is drawn from the tank, it is replaced by cold from the cold tank, which in turn is fed to the boiler. This is direct heating of the water by either a) the immersion or b) the boiler. The hot water is simply stored in the tank. To identify a direct water system you will find the end of the vent pipe fixed above your cold water tank. This allows for any stem expansion in the cylinder to flow directly into the cold tank and not damage the cylinder or cause air locks in the system. 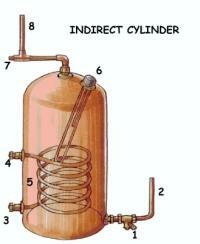 With an indirect water system, the copper hot water cylinder contains a coil of pipe. This coil forms part of a run of pipework attached to the boiler. It is heated directly by the boiler. Indirectly, it heats the water in the cylinder. The coil, or "heat exchanger" forms part of the central heating circuit, and its water heating abilities are purely a by-product of its main function, which is to heat the radiators. This heating is called the "primary" circuit, the pipes running to and from the boiler are called the primary flow and return. 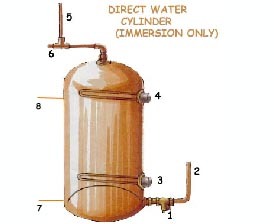 The hot water tank operates in exactly the same way as the direct system. To identify an indirect system, you will see two water tanks in your loft. The second, smaller one, is the feed for the primary circuit. It will top up the system when necessary and will also have a vent pipe over the top. The level of water in this tank will be considerably lower to allow the water to rise as it expands when it gets hot without overflowing. Both of the boiler systems above are called "vented" systems. Because of this vent pie, they are open to atmospheric pressure and operate as "low pressure" systems. They both call for cold water from a cold tank stored, generally, in the roof space. Because they are low pressure, sometimes the flow from the taps etc is not as great as one might like and pumps can be introduced, both for the domestic hot water and the heating, to give greater flow. In 1989 unvented systems were allowed into general use. The unvented system operates purely from mains water. The principles of heating are the same, but because everything is under the pressure of the mains water, flow rates are much better… Many safety devices are built into this system to accommodate for the greater pressure and expansion of the water. Although a small tank may be found in the loft for venting and feeding your central heating, No cold water storage tank is necessary. Hot water cylinder capacity varies between 25 gallons to 50 gallons for normal domestic supply, with the larger being enough to supply an average family for a day. Most cylinders are made from stainless steel but thin copper may have been used in some of the older tanks. You should make sure your cylinder is well lagged to prevent heat loss. Pre-lagged cylinders are available, which are coated with foamed polyurethane. A revolutionary new concept (British development) which reverses the indirect principle detailed above. The boiler heats the water and sends it to a cylinder, and then on to the central heating. On its way it heats, in the cylinder, via a very efficient heat exchanger, the mains fed water for the taps. An integral feed and expansion tank can be incorporated on top of the main tank. This system is so efficient, a thermostatic (cold/hot) mixer valve is built into the pipework before the hot reaches the taps or shower. For the two part tank to be viable, the system must be installed at the highest possible level in the house, however it can be installed with the feed tank separately installed in the loft. This system is now available with its own dedicated boiler allowing the central heating to be switched off in summer. The ultimate in combination systems. Single point water heaters come in both gas and electricity "flavour" and are sited, generally, next to the point they serve. In the case of an electric heater (an electric shower is an example) They must be wired to the mains via an isolating switch. A heater up to 3kw can be plugged into an ordinary 13 amp socket, but that socket must not be in reach of the water outlet. Above 3kw, the heater must be wired directly to the fusebox with a double pole isolating switch in the circuit. In the kitchen, this switch may be wall mounted, again, out of reach from the sink, but in the bathroom it must either be a cord operated switch on the ceiling, or an isolating switch outside the room. Differing cable sizes are needed for differently rated heater and checks should be made for the particular heater you wish to install. Single point gas heaters of the old "Ascot" type are based on a thermostat sensing the arrival of cold water into its reservoir when water is asked for from a tap. As soon as the tap is open, fresh cold water comes in to replace that being drawn from the tap. This triggers the ignition of the burners which heat the water. The hot water rises to the top and is available immediately. The most common of these is a combination boiler. These heaters operate on the same principle as above, but can serve many points (taps, washing machine, etc) as well as, in the case of a combination boiler, supplying the hot water for a central heating system. An ordinary multi point heater will only supply water to the domestic water system but can be installed in conjunction with an ordinary central heating boiler. A combination boiler combines the functions of a central heating boiler and an instantaneous multi point water heater, giving priority to the supply of domestic hot water. Combination boilers can be direct or indirect in much the same way as the cylinders above, using calorifiers (heat producers) to heat water passing through them. Additional video information on how an immersion heater works can be found over on YouTube. What Type Of Central Heating Boiler Should I Get? Should I Choose A Combination Boiler For My Hot Water System?